I know today I was supposed to share the wonderful salad I made a few days ago but I think my breakfast deserves the spotlight. Especially since everyone seems to be all about these right now! And I have a small confession to make something I would have never thought possible! I am getting a bit sick of my daily bowl of oatmeal, I know this is shocking! But as I was flipping through recipes last night Pumpkin Pancakes caught my eye! The only problem was that I was not finding a recipe that I absolutely fell in love with. The recipes either had way way to many ingredients or had things I didn't have (like bisquick). So I developed a plan or I guess an idea and prayed that today when I set out to make these pumpkin pancakes that my idea would work! Not only did I want pumpkin pancakes today, but I wanted those pumpkin pancakes to be oatmeal pancakes. I know I know just a few small demands. Well remember those Applesauce Oatmeal Pancakes I feel in love with? The ones from this post? Well my thought was why couldn't I sub in pumpkin puree for the applesauce? They both have the same consistency, and would not change the nutritional stats of the pancakes at all! And you know what that crazy idea worked! This morning I was happily munching on delicious pumpkin pancakes with a pumpkin yogurt topping! Then combine all the wet ingredients in a separate bowl. Add your wet ingredients to the dry ingredients and start flipping pancakes! Cook the pancakes as you would a normal buttermilk pancake, about 3-4 min per side. Wait till you see tiny bubbles form and pop to flip your pancakes! For the Pumpkin Yogurt Sauce! Combine all the ingredients together stir and enjoy! I ate all the yogurt atop my pancakes with a bit of peanut butter! I have to say there was jut the faintest hint of pumpkin to these pancakes, that is why I added a pumpkin dipping sauce! But still they were YUM! I will leave you with this, enjoy your Thursday and remember to live Happily Ever Healthy! This quote was emailed to me today and I laughed a bit to myself when I read it! "Always behave like a duck-keep calm and unruffled on the surface but paddle like the devil underneath"
YUM!!!!!! I want to try these this weekend. I've never had oats in my cakes before! I love the texture that it provides in the pancakes!! I hope you like them! Mmmm those sound great! 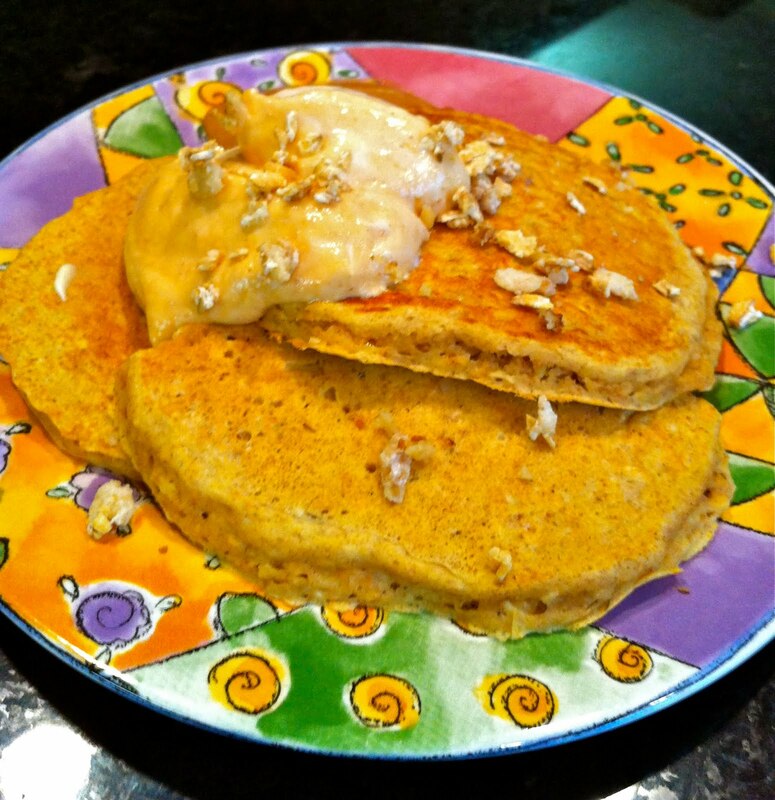 I've never had pumpkin pancakes...I must try these soon! I love oatmeal in everything and anything so good choice! Oh how I love this time of year where you can add pumpkin into everything. This recipe sounds amazing I will definitely be giving it a try this weekend! i will take pumpkin oatmeal pancakes any day definitely thanks for posting the recipe this is a must make soon! Oh my gosh, those look so so yummy - can I eat them right off the page?!?! I have to make these!! THANK YOU! I am beyond excited! I can see a lot of cooking light recipes appearing on the blog!! Thanks again!!! YUM! The caterers for our sorority made this pumpkin lasagna that was to die for!! PUmpkin Lasagna sounds yummy! What sorority are you in?